The same basic design of original "FAST ACTION SAFE", but with a smaller overall footprint and designed to safely store most compact size semi-auto handguns (Glock 19 and similar) or smaller and medium frame revolvers or smaller and allow very fast retrieval when needed. A full size semi-auto (Glock 17 w/standard grip length and similar) will fit in this safe, but that is the absolute maximim size handgun. 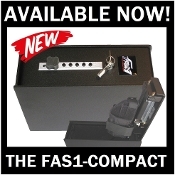 This safe is a great option for your CCW. There is a maximum of 5.75" in height available inside this safe under the lock. That would be the maximum overall height measurement of your gun that will fit inside this safe. A Ruger SP101 and similar size revolvers will also fit and work well with our new modular holster that is in this safe. The maximum overall length of any gun needs to be under 8.00" to fit in this safe. TWO LOCKING BOLTS - FAS1 exclusive on a "Simplex" style mechanical lock. MODULAR HOLSTER - Our new FAS1 designed holster for the best fit of a variety of handguns. Fits all types of handguns with or without accessories such as weapon mounted lights and RMR's. Gun depth within the holster is adjustable by the internal Velcro strap for optimum grip exposure regardless of size. A Velcro flap with securing strap to adjust the holster for the best overall fit for all types of handguns and revolvers. Inclues a removeable thumb break for added security if needed. 90 DEGREE DOOR OPENING - The door swings fully open to 90 degrees. This allows for easy adjusting of the holster fit without disconnecting the gas spring. The door will open slightly more if needed by disconnecting the gas spring from the doors ball mount. This is similar to all our FAS1 safes. Manufactured in the U.S.A. utilizing 3/16" steel plate (7 GA) for the door and all sides. The hinged door is recessed and has a door jamb to discourage prying. Solid 3/8" hinge pin is welded in place and and covered when the the door is closed. The handgun is mounted in our new, exclusive modular holster to the underside of the door. A gas spring opens the hinged door rapidly to present the firearm to the user in a consistent manner for ease of retrieval when the proper combination is entered and the knob twisted 1/4 turn clockwise. Approx. 11-1/4"L x 8-1/4"H x 4-1/8"W.
Since the door is recessed, the height at the knob is approx. 8-3/4". Shipping weight is 22 lbs.